Chimichurri, Salsa Verde, and More! Herbs. 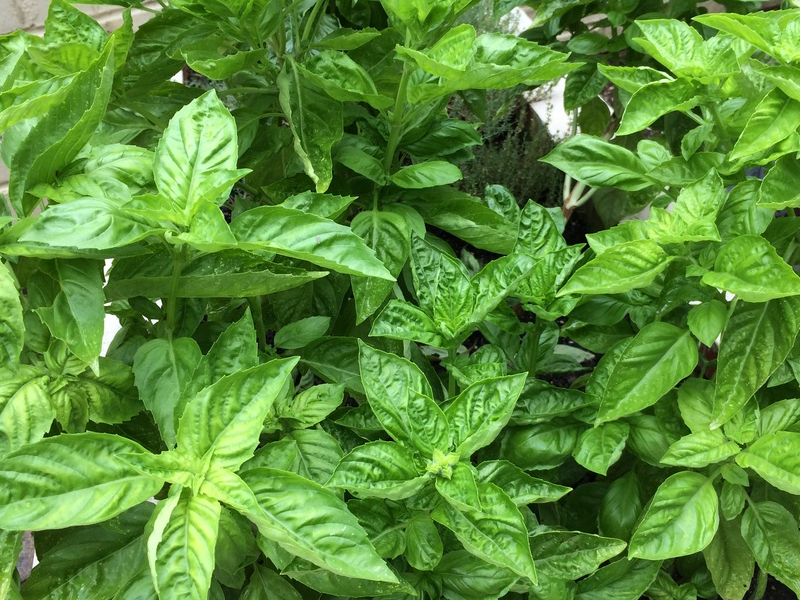 There’s so much beautiful flavor and aroma in a summer herb garden. And on the third consecutive day of freezing temperatures that sure seems like a long way off. Adding herbs to the menu on these cold days is a great way to brighten some cold-weather cooking. Maybe the best part is that herbs won’t just add zest to these dishes, but they also deliver great nutrition. In fact, most herbs common in our markets are as nutritious as kale and other leafy greens. If you can take the time to smash your own herbs with olive oil, citrus zest, and maybe some garlic or nuts, the variety of herb sauces and dressings you can make will be right at home with everything from grilled fish or chicken to raw veggies to pasta or quinoa or a hearty bowl of soup. Pesto, Pistou, Gremolata, Chimichurri, Salsa Verde, and More! Across the Mediterranean region, traditional cuisines developed green condiments and sauces made from herbs such as basil or parsley combined with olive oil, garlic, and sometimes nuts such as pine nuts or walnuts, and often a bit of hard cheese such as Parmesan. Whether it’s Genovese pesto, South American Chimichurri, or Northern Italian style gremolata, this heritage of green condiments and sauces brings superfood nutrition to your table. Chimichurri traditionally accompanies grilled red meat. It’s as simple as loading up the food processor and cleaning up. Combine 1 cup Italian parsley, 1/2 cup cilantro, 2 garlic cloves, 1 seeded jalapeño, 1/2 cup extra virgin olive oil, 1/4 cup red wine vinegar, a big pinch of ground cumin and a teaspoon of kosher salt. Pulse them together in the food processor and then allow the flavors to develop for at least half an hour before serving. It’s a great addition to a rice dish, and used as a dressing for a grain salad it pairs well with all kinds of vegetables. Chimichurri is so good for you – Parsley is packed with iron to boost energy, and it delivers chlorophyll, which oxygenates blood, detoxifies metals in our body, and feeds good bacteria in the gut. Another great source of fat-soluble vitamin K, parsley is associated with promoting bone health and limiting neuron damage in the brain. Parsley is one of the herbs highest in antioxidant beta-carotene. Cilantro may reduce LDL cholesterol in the blood. It is high in antioxidants such as beta-carotene, and a good source of folate, and fiber, as well as minerals calcium, potassium, manganese, iron, and magnesium. Cilantro is also a great source of vitamins K, A, and C.
Gremolata originated in the cuisine of Milan. It is a simple pairing of garlic, lemon zest, and parsley. Try it over blanched green beans or asparagus. It was traditionally served over meat such osso buco. To dress about a pound of green beans or asparagus combine 2 cloves of garlic, minced, with the zest of two medium lemons, 1/4 cup of minced Italian parsley. If you’d really like to ramp it up add 3 tablespoons of freshly grated Parmesan, 2 tablespoons of pine nuts and about 2 tablespoons of your favorite olive oil. For a short cut, I use my microplane zester for the garlic and lemon zest and only have to chop some parsley. Pesto, made from Genoa basil, the variety common to our markets, is a wonderful addition soups such as minestrone, and of course an ideal dressing for pasta and potatoes, or an Italian sandwich. Basil contains flavonoids that protect your cells from oxidative damage. Its essential oils deliver anti-inflammatory and anti-bacterial benefits. Basil is high in vitamin A, essential for vision and maintaining healthy skin. It is a good source of vitamin K, which is important for healthy blood clotting and strengthens blood vessels to reduce dark circles and prevent varicose veins. Basil is also an excellent source of iron. 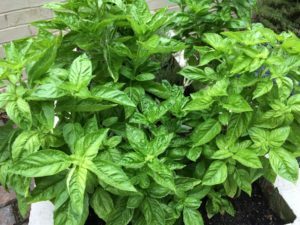 Make big batches of basil when your herb garden is full, and freeze 2 tablespoon portions in ice cube trays. You’ll have the bright, warm taste of summer all winter long. Combine 3 tablespoons of pine nuts and 1 clove of garlic in the food processor or with a mortar and pestle. When the garlic is smashed to a paste and the nuts are finely ground, incorporate a cup of packed basil leaves, 1/4 cup freshly grated Parmesan, and a big pinch of salt, and then slowly add in 1/4 cup of olive oil.